As vacation rental marketers, we work so hard to get visitors to the website and into the booking funnel. We watch them spend minutes on the site (using technology like HotJar) finding the perfect rental and even get to the booking page. But then it happens. The mouse stops moving. The session ends. WHAT?! If this is what you have been experiencing, here’s a few easy things to do, and some more complicated that will help you drive conversions and more direct vacation rental bookings. 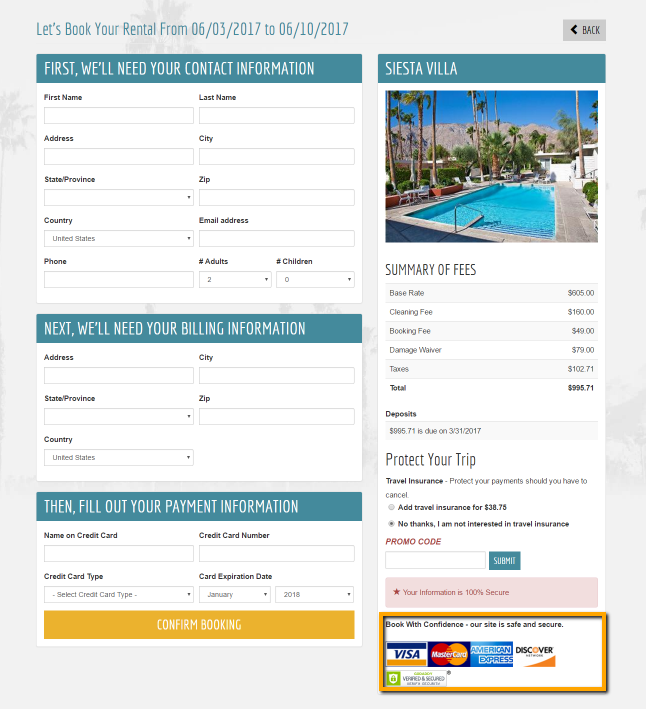 1) Add Urgency Features to your booking pages. We first saw these on hotel sites in 2015 like Hotels.com and thought, “Hey, what a great idea. Let’s try that on our vacation rental booking engine”. Since then, it’s become almost a staple. Urgency helps communicate to the visitor that there other people searching on the site, this property has been viewed, or that your dates are popular and you should hurry up and book. 2) Make the booking experience super quick and easy – even on mobile. By “super quick and easy” we mean less clicks and easier forms. No more than a couple steps. Find your rental, here’s a page to book. Sometimes other booking engines break up the check out into steps, but we don’t. One page, easy to navigate forms, and boom – you’re booked. 3) Give them a deal. Are you hiding your specials? Why? Specials drive conversions, especially when you make them easy to book online. Simple promo codes at check-out are convenient ways to allow for discounts. 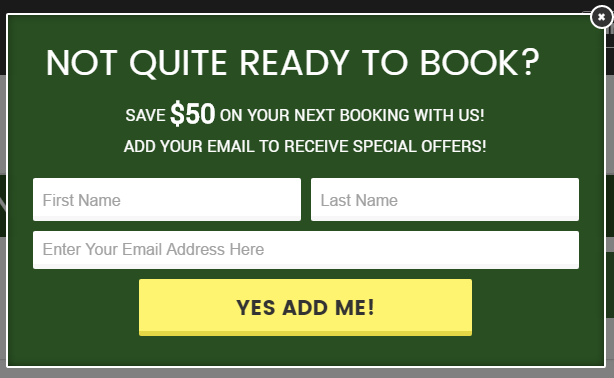 Or you can add a modal pop-up to collect email addresses and give a specific amount off, like $25. Implementing this is sure to drive conversions and add email addresses to customers who are ready to book direct with you! 4) Send them an abandonment email. If Amazon does it, you should probably do it too and here’s the results to prove it. When a guest gets to the check-out page and abandons the form, we like to send them an email a few hours later. Sometimes people don’t want to do it on their phone, or just want to triple check with their traveling party. So make it convenient and send them an email directly back to book their stay. We also have a pretty cool trigger on the bottom of the site to get them back to where they left off with booking. So there you have it. ICND is the leader in bringing these great ideas to the VRM industry first. These strategies are proven to help drive direct bookings on your website. You worked so hard to get them there, you might as well put as much effort into having the features to help get them to book with you. For more ways to drive bookings, check out our websites in live action in our portfolio or contact us today.